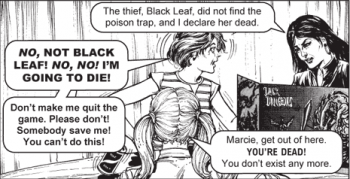 Once upon a time there was a middle manager named J.R. Ralls, who won $1,000 and said to himself, 'it's time to make that Jack Chick movie I've been dreaming of all my life.' Dark Dungeons, Chick's most infamous piece of anti role playing art, was what Ralls set his heart on, and somehow - possibly through the use of actual magic - Ralls persuaded Chick to grant him film rights. Of course, $1,000 isn't going to be quite enough to bring Chick's masterpiece to the big screen, so Ralls has taken his vision to Kickstarter for the remaining $12,500. "I am the best person to make this project work because I am the only person who CAN make this project work," says Ralls, as he points out that there's no guarantee Chick will ever sell film rights to his work ever again. His Kickstarter's $12,500 isn't going to buy top-of-the-range CGI, so expect puppet demons chasing hapless Debbie rather than anything more sophisticated. All Ralls can really promise is his time, energy and love, which he hopes to alchemically turn into film making gold. Incidentally, for those of you who fancy yourselves Black Leafs (Leaves?) in training, pledge enough cash, and you too could be immortalized in Ralls' magnum opus. A pledge of $299 gets you a voice acting role, while $399 - and whatever it might cost you to get to Portland, Oregon - gets you a speaking cameo moment, plus an invite to the wrap party. Cheap at twice the price! But if all you want is the movie itself, $15 gets you the digital version, $20 the vanilla DVD, and $25 the Collector's Ultimate Edition DVD. There's still 29 days to go on this Kickstarter campaign. If ever you've wanted to see Jack Chick get the film his work deserves, now's the time to pledge. Update: Well, it's official; the Kickstarter is now funded. The ask was $12,500, and it now has $13,687 as of time of writing, with 20 days still to go. What's more, two pledges put in $399 or more, which means they snapped up two of the four cameo acting slots available. Another paid $700 to have both a speaking cameo role and the right to write and have filmed a two minute alternate ending.